In 1914 most Americans did not want to become militarily involved in what they viewed as a European dispute. Progressives wanted to focus on political and social reform in the United States. For many Americans, isolationism was a strongly held belief. Immigrants who had come to the United States to escape the harsh, mandatory military service prevalent in Europe had no interest in returning to wage war. Americans of Germanic and Austrian heritage did not want to combat friends and relatives back home. While the Irish were fighting the English for independence, Irish-Americans were not eager to lay down their lives for England. In 1916 Americans reelected President Wilson who campaigned under the slogan "He Kept Us Out of War." Between 1915 and 1918, the "about-face" in American public opinion from nonintervention to a strong pro-war embrace can be seen in popular music. 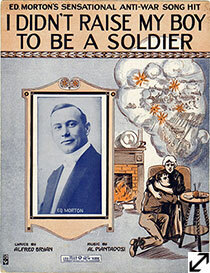 I Didn't Raise My Boy to Be a Soldier, 1915. Lyrics by Alfred Bryan (1871-1958). Music by Al Piantadosi (1882-1955). Published by Leo Feist, Inc., Lent by Stefanie Kies. This was the first anti-war song to enjoy widespread popularity, so much so that it inspired imitations as well as parodies such as I Did Not Raise My Boy to Be a Coward and I Didn't Raise My Boy to Be a Soldier, But I'll Send My Girl to Be a Nurse. 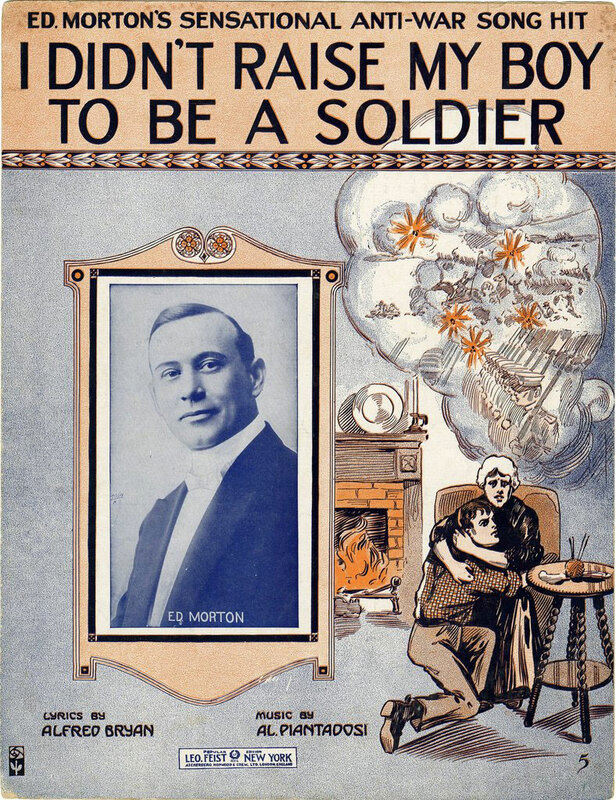 Theodore Roosevelt remarked that "foolish people who applaud a song entitled I Didn't Raise My Boy to Be a Soldier are just the people who would also… applaud a song entitled I Didn't Raise My Girl to Be a Mother." Written between the establishment of the first relief efforts for Belgium and the sinking of the Lusitania, it sold 650,000 copies in the first three months. 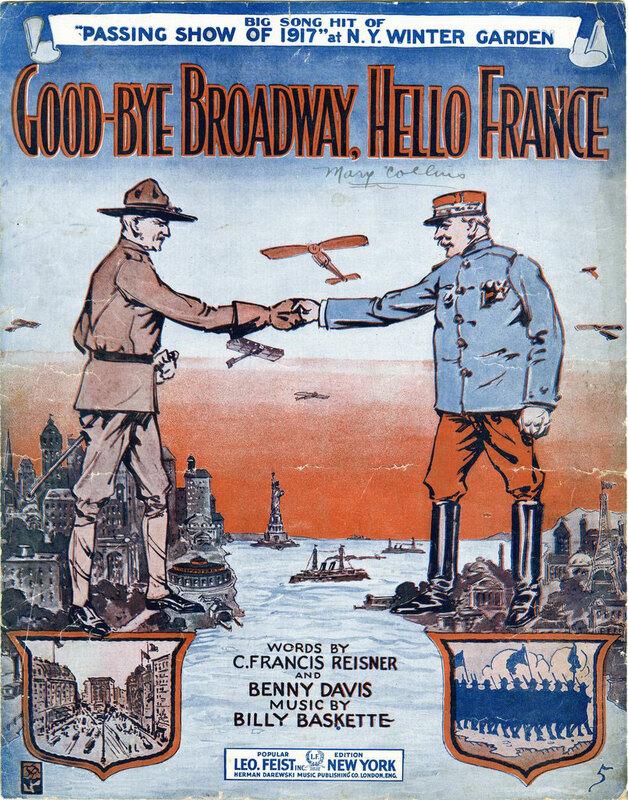 Good-Bye Broadway, Hello France, 1917. Lyrics by C. Francis Reisner and Benny Davis (1895-1979). Music by Billy Baskette (1884-1949). Published by Leo Feist, Inc. Greenwich Historical Society, William E. Finch, Jr. Archives. This song was first introduced in the stage musical The Passing Show of 1917. From 1912 to 1924 Lee and Jacob Shubert produced elaborate productions designed to compete with the Ziegfeld Follies. 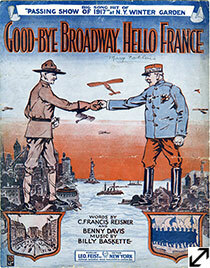 Initially the songs reflected the President's and Congress's isolationist position but by 1917 they included lyrics like "learn to shoot for your Uncle Sammy" in Johnny Get Your Gun and "now that we have the chance we'll pay our debt to France" in Good-Bye Broadway, Hello France.